Few things are more reminiscent of the art and tradition of boxing than the sight and sound of a speed bag being knocked around. Speed bag training is not only one of the core staples of getting ready for the ring – it can be used to improve endurance, develop rhythm and get into shape. Training with a speed bag can help you build your shoulders and arms through the high repetitions offered by a boxing-style workout. This tool isn’t enough to get your whole body into shape, but is certainly a tool that can help, especially if you are a boxing enthusiast or you’re simply a big fan of the Rocky movies. 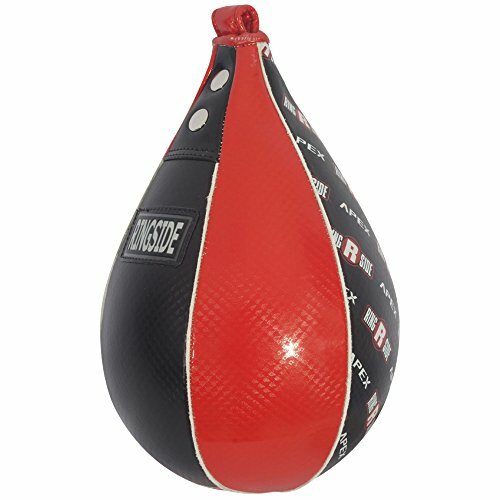 Though a speed bag seems like such a simple item, there are quite a few of them on the market in various styles and materials. This variability can make it difficult to differentiate the bags of good quality and the bags of poor quality, since there are certain brands that carry notoriety, but not necessarily top-tier quality. Balazs is a household name where boxing is concerned – they have produced sturdy, specialized boxing equipment since 1997, and they have a pretty big brand following in the fitness industry. 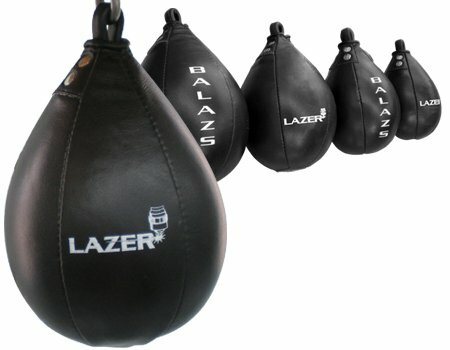 The Balazs Lazer Speed Bag is another example of the brand’s legacy of producing top-quality boxing equipment and accessories. This bag made my top pick as the best speed bag for a few reasons, but mainly because of its durable construction – let’s take a look at the specs on this bag, and what makes it good enough for the top spot on the list. First, one thing that stands out immediately about the design of the bag is the lack of welting or laces. This does take a bit away from how traditional the bag looks, but this wasn’t an oversight, it was a conscious decision to increase quality. 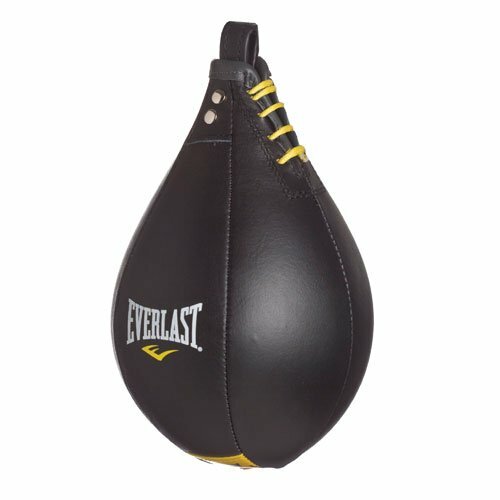 The interior bladder (the rubber interior of a speed bag that holds air) won’t pop or deform, like it will in many other speed bags. For this reason, the bladder may need to be inflated from time to time, but never replaced or patched, so the laces have been removed to create more area for comfortable striking. The welting is also missing for a reason: the Balazs Lazer has identically sized, stamped production panels and is made from high-quality soft grain leather. Most manufacturers have a little variability with the panels and use welting to stitch longer panels to shorter panels, Balazs fixed this problem with some manufacturing ingenuity for a more hit-able bag that is more comfortable on your hands. However, for a top-quality bag, you are going to be looking at paying a bit more, as this bag is listed at $84. With that said, you will be getting what you pay for in terms of durability, and this bag can easily be an alternative to replacing 2 or 3 bags that add up to the Balazs’ price. Looking for the best? This is it. The next speed bag on the list comes from one of the most recognized brands in all of fitness, not just boxing. TITLE has been involved in the fitness and martial arts worlds since its inception, and they are famous for pumping out superior-quality equipment in nearly every niche – their boxing equipment is no exception. 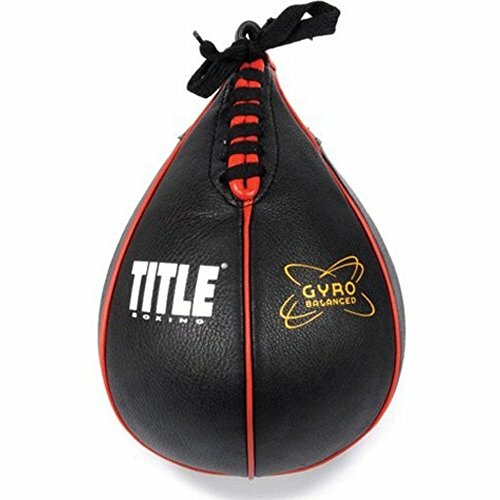 Their Gyro Balanced Speed Bag has the look and feel of a traditional bag with a little extra bit of engineering to up the value – and it is quite the value at between $40 and $50 depending on the size. This bag didn’t make it to the top spot, unfortunately, but that was simply due to the unmatched quality of the Balazs – not through any particular fault of the Gyro Balanced Speed Bag. The laces, welting and slightly inferior rubber bladder have knocked this bag down from the top spot into the still respectable 2nd position. Now that the downfalls are out of the way, let’s take a look at the positive qualities of this bag. This speed bag is also constructed of soft-grained leather, and it features what TITLE call “gyro-balanced manufacturing”, which is explained as ultra-precise spacing of the bladder within the bag, as well as the exterior components of the bag for even rebounds every time. While several speed bags do have problems with the bladder popping or leaking, the feedback on this item has been overwhelmingly positive, and there are very few reports of a faulty bladder. This bag isn’t the best of the best, but it is at the right price to still be a fantastic value for a high level of quality and one of the best bags out there. The Ringside Apex Speed Bag is as flashy as Apollo Creed, and just as tough. This synthetic bag, offered in many colors, has a specialized shape and construction to ensure durability and speed. Ringside is another household name in boxing, and they are one of the authorities not only on products of other brands, but producing their own, in-house products at an extremely high level of quality for novice, as well as experienced boxers. While this bag is tough, it is also tough on your hands, as it is made from super-tough synthetic materials to resist rips and general damage. Using this bag without wraps can be tough on your hands, especially after several circuit sets or a long session. For this reason, and this reason alone, I had to drop the Apex bag down to the 3rd spot. However, if you always use hand wraps, or you aren’t opposed to doing so, you can get a lot out of this bag, including value: this bag is the cheapest on the list. Consumers love this bag for the price, as well as the tear drop shape that allows it to cut through the air and move more quickly than speed bags with a more rounded construction. There have been very few reviews concerning quality, as this bag is tough as nails, and flashy to boot. If you’re into having a pop of color in your home gym, this bag comes in 4 different bright color combinations. If you don’t mind using wraps, or you have naturally tough hands, this bag could be a fantastic value for you. Everlast is another one of those brands that, whether directly or indirectly, more people who have ever been in a gym or picked up a boxing glove are at least moderately familiar with. This brand’s martial arts equipment is pretty widely purchased and highly-applauded, so it’s no surprise that their Everlast Elite Leather Speed Bag have made it onto the list. Before I tell you about the great aspects of this bag, there have been some quality issues that have dropped it to 4th place. There have been slightly more than a few customers who have had negative experiences with the bladder on this bag needing to be replaced. Since a speed bag should be something you can beat on ‘til the cows come home and not have to worry about a leak or tear, I’ve dropped this bag down to the 4th spot. This bag does have several redeeming features, though, that have placed it up on this list in the first place. Like the top 2, this bag features soft-grain leather; and, like the top pick, this bag lacks the welting that can cut up sensitive hands. If you are a beginning boxer, or you have never been predisposed to the use of hand wraps, this bag can be a way to get a comfortable speed bag at a price that is a little less than the top 2. That’s right, another TITLE bag. As one of the top 5 brands in boxing, it’s not shocking that they have 2 bags in the top 5. The TITLE Classic Speed Bag is your straight up, old school speed bag without the bells and whistles that some of the other bags feature. Lightweight leather, triple-stitched welting and a reinforced loop – pretty bare bones. This classic bag is a great basic bag for beginners, or someone who has been out of the game for a while and are dipping their toes in the water. Because this bag is so bare bones, it was beaten out by the other bags on the list, placing it in the 5th spot, but that doesn’t take away from this bag’s necessary and deserved spot on the list. It doesn’t measure up to the others in quality, as the leather is lightweight and moderately durable, but hard, and there have been some issues with the bladder reported by consumers. Since the leather on this bag isn’t of a completely soft-grain, it might still be advised to use hand wraps for brand-new users; however, this bag won’t tear up your hands as badly as the Apex bag, so after a few weeks of regular training you should be able to build up your hands to use it bare-handed. As far as price, it is similar to the Apex bag, but the top-end of the range of sizes is slightly more expensive. 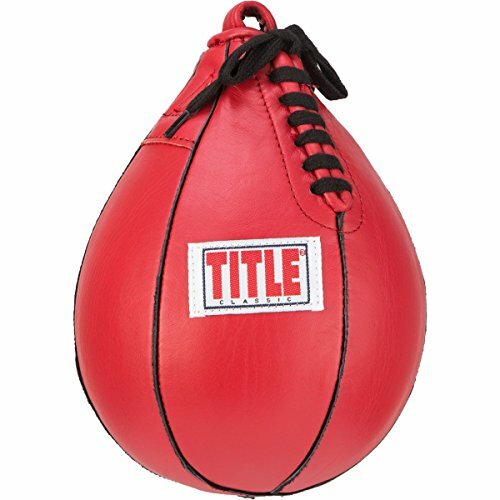 If you’re looking for a basic, classic bag that will rebound well and last you long enough to decide if speed bag training is really something you’re interested in, this bag is great for hopping into training without the risk of beating up your bare hands. With all of these great options, how are you supposed to choose? Picking out the right speed bag for you requires you ask yourself a few questions. First, what is your experience level? Beginners are advised to start with larger bags because they rebound more slowly and give you a larger target to swing it. Once the larger sizes are mastered, it is recommended to move to medium, then small bags to keep challenging yourself and avoid your workouts becoming stale. Smaller bags are harder to hit and rebound a lot faster, so it’s more challenging (and thus rewarding) for experienced users to use them. Another choice you’ll have to make regarding your speed bag is the material. There are some purists out there that believe that only bags made of genuine, high-quality leather are good enough, but the reality is that there are several synthetic bags out there that have outlasted leather bags, as well as vice versa – the variability lies more bag-to-bag than between different materials. However, these materials will also rebound differently, as sometimes synthetic bags can be more springy on the rebound due to the stiffer construction. For this reason, synthetic bags can also be tougher on your hands; but, if you’re using wraps or gloves, it shouldn’t be a problem. The last thing you’ll have to decide is the outer construction of the bag and whether you want welting or not. Welting are the vertical ridges that stick out from the panels of the bag where they are sewn together. Many don’t like welting because it can cut up the hands, but some feel it’s necessary for more direct hits and more predictable rebounds – this makes welting more popular among beginners, as the ridges extend from the bag and give more defined “sections” to aim for and that will hit the platform. If this sounds like something that appeals to you, then you’ll be in luck because many models out there have welting; and they’re generally less expensive than ones that don’t. If you’re at a high-level, or simply prefer not to have welting, you’re most likely looking at spending a little bit more money. Unfortunately, a speed bag can’t be used on its own – you’ll need a platform. There is a wide variety of speed bag platforms out there, and they all have some pretty distinct advantages, disadvantages and levels of quality. Luckily for you, we have a best speed bag platform article. Finding the right platform and making sure that it’s installed correctly is a large part of the battle of setting up your station for efficient and effective training. Whether you decide on a cheap platform or something that looks like it could withstand a nuclear attack, you’ll need it secured to the wall (or ceiling) and level. Hand wraps are another necessity for speed bag training. Speed bag training isn’t a 10 or 20-second ordeal, it’s a method of endurance training and should be performed for longer durations. With that said, speed bag training can be tough on your hands if you don’t have any protection, especially if you’re a beginner. Wrapping your hands is a good way to ensure that you’re still getting the feel of the bag without bulky gloves, but you’ll remain protected and avoid tearing up your hands. 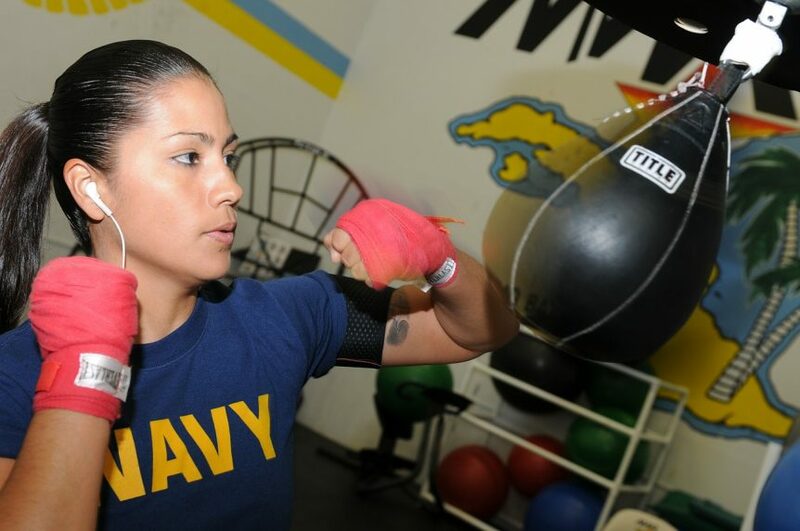 Engaging in speed bag training is rewarding not only to those who plan to pursue boxing, or boxing style workouts. The power, speed, coordination and endurance gained from this type of training is hard to replicate with other tools, which makes it a great home fitness equipment piece to have as a part of your home gym. There are several types of speed bags out there; so if you decide to stray from the top 3, pay attention to some of the key features we have highlighted with each bag – that will help to guide your decision and assist you in finding the perfect speed bag for you.